I often go to the forest to guide tourists for watching paradise birds. I have done it since 2010. These beautiful birds have become art inspiration for me. I have made some drawings and watercolour painting of paradise birds that are now available in prints on various products in Redbubble website. Whaleshark is one of the largest marine animals in the world. It can be seen in various parts of the world such as in the Philipines, and in Kwatisore waters of West Papua. I have created several drawings of whalesharks as a way to raise awareness about the importance of preserving our marine environment. There are thousands of species of fish, coral reef and other marine creatures that need to be protected. The drawing was re-drawn using vector graphic software. Now, this vector graphic is available as merchandise for anybody who is interested in buying it as t-shirts, mugs, or key-chain. 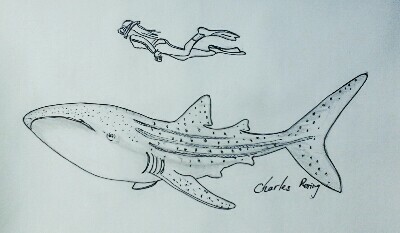 I also created another vector drawing of whalesharks whose sizes could be compared with human that is represented by a free diver. Whaleshark is the largest fish in the world but its not a dangerous animal. It will not attack human because its main food is small bait fish. Tropical rainforest is the natural habitat of a lot of species of animals. One of them is Birdwing butterfly Ornithoptera priamus. It lives in the forest of New Guinea. Butterflies play important roles in the ecosystem of rainforest. They pollinate wild flowers from various kinds of trees. A lot of people like to collect butterflies because they look beautiful. As more forest is being damaged by human activities, butterflies and other wild animals move deeper into the jungle. Now the trading of birdwing butterflies is highly regulated by CITES and conservation office. 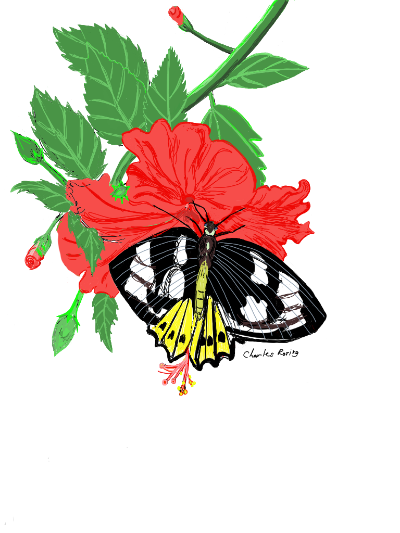 To create awareness among us about the importance of preserving tropical rainforest, I created a drawing of Priamus Butterfly and Hibiscus Flower. Papuan Hornbill birds live in the jungle of New Guinea and the surrounding islands in the Pacific region. They are considered as the symbol of true love. They are often seen flying together as a loving couple. But local people in West Papua say that if one of the birds die, the one that survives will continue to live alone for the rest of his or her life. 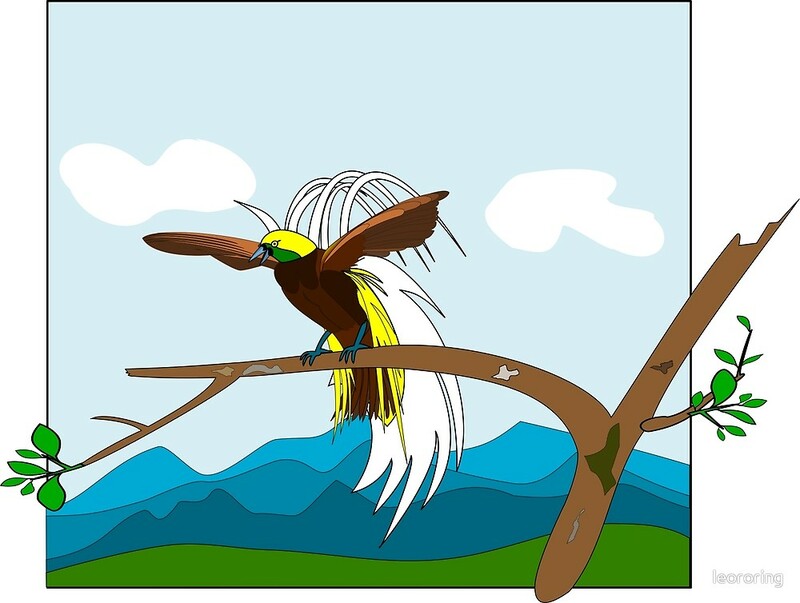 That's why we also sometimes see a Blyth's hornbill flying solo in the forest."